A tired and dated master bathroom finally gets a new life through a complete renovation! A giant bulky tub (never used!) and a tiny dark corner shower that the homeowners have been putting up with for years are removed giving way to a spacious and elegant master ensuite with an amplitude of thoughtfully designed storage space. Shower fixtures: Alt by Aquabrass in Electro Black. Linear drain: Easy Drain. Wall tile: 12” x 36” marble-printed porcelain tile, vertical stack installation. Floor tile: Terrazzo-print tile, 24” x 24”. Toilet: Crosswater. Cabinet hardware: Top Knobs. Robe Hood: Kartners. I guided the homeowners to reclaim the space in the areas needed most - luxuriously spacious shower, large vanity with expansive counter surface and plenty of drawer storage and a full tall cabinet with a combination of closed and open shelving. This spa-like bathroom is as beautiful as it is functional. Light and airy combination of finishes is complemented with warm textured millwork, a terrazzo flooring (which has seen a huge comeback and is a currently a beloved staple in the design world!). 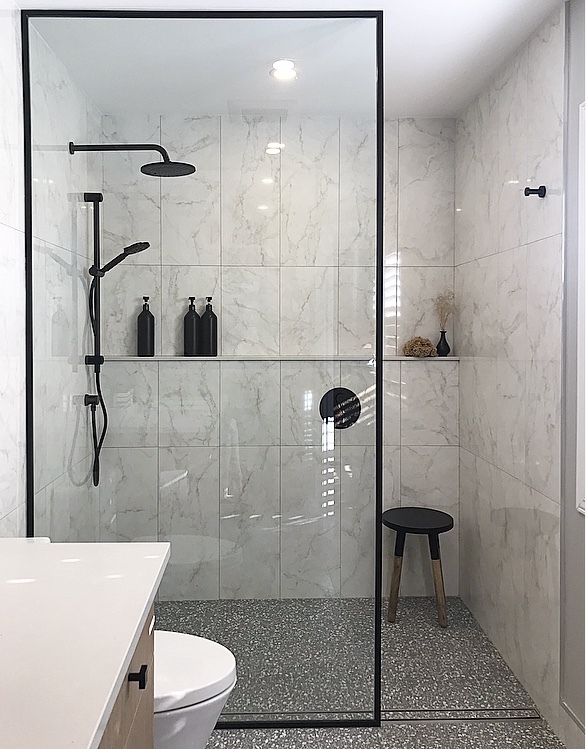 The lighting, shower fixtures, faucets and accessories are accents in matte black, providing a sharp contrast and resulting in a beautifully balanced space. Millwork: Miralis custom millwork, supplied and installed via Astro Design Centre. Countertop: Caesarstone 4001 Fresh Concrete. Faucet: Alt by Aquabrass in Electro Black. Light: Matteo Lighting. Black framed shower partition has strong visual impact and creates an interesting focal point.